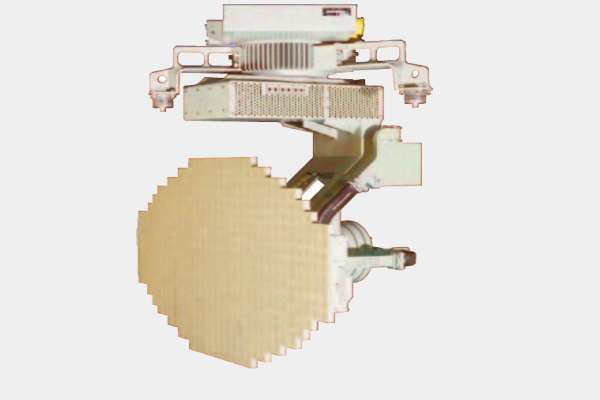 The AN/APN-242 is an X-Band color weather and navigation airborne radar developed by Sperry Marine (now Northrop-Grumman) as replacement for the older AN/APN-59. The APN-242 Antenna Unit consists of a flat plate array and mounting pedestal and uses the existing APN-59 installation and mounting brackets. The array element improves target detection ranges and is electronically controlled to permit instantaneous fan beam/pencil beam switching. The antenna rotates freely through 360º and is connected to existing aircraft attitude reference systems to provide antenna stabilization throughout the normal range of aircraft maneuvers. High reliability is achieved through the elimination of all gears, improving antenna MTBF by a factor of fifty. The APN-242 Receiver/Transmitter uses a lower power solid state design, a low-noise receiver and a three to one component reduction to improve system performance and greatly increase reliability. Transmit power is generated by a 10,000 hour service life state-of-the-art magnetron with digitally controlled pulse width, pulse repetition rates, intermediate frequency (IF) and video amplification, mode switching and built-in-test (BITE). The ASN-165 Display Group provides a vivid color or monochrome radar image in ambient lighting. These high resolution displays are overlaid with aircraft navigation data such as true heading, ground speed and track angle error. A latitude/longitude stabilized cursor is provided to aid drop zone and waypoint identification. Depending on the aircraft mission design series, data from the station keeping equipment (SKE), self-contained navigation system (SCNS) and traffic collision avoidance system (TCAS) can be integrated and displayed. In the green mode, the displays are night vision goggle compatible.